iSchool program fees for full-time tuition are listed below. Please refer to the Fees section of the University Calendar for the most up-to-date and detailed fee schedule information as this information is subject to change. * Note: International students may be automatically eligible for an International Tuition Award valued at $3,200 per year. U.S. students applying for Direct Loan funding are strongly encouraged to contact a UBC U.S. loans specialist at usloans.inquiry@ubc.ca to learn more about funding restrictions. 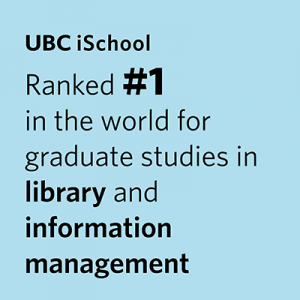 Both the iSchool and UBC’s Faculty of Graduate and Postdoctoral Studies offer funding and awards packages for graduate students at various levels. Visit the Awards section for more information on iSchool-specific awards. All master’s students are automatically assessed fees under the payment Schedule A. Part-time tuition payments known as Schedule B, is only available by application to and approval by the Faculty of Graduate Studies. Applications for Schedule B must be submitted prior to beginning your program. Students are prohibited from switching tuition payment schedules during their program. Note: Part-time students are ineligible for the majority of awards offered by the School and the University. Every candidate enrolled in a graduate program is required to maintain continuous registration by paying tuition installments according to schedule A or B plus authorized student fees, as listed below. Tuition fees are payable in three (3) installments per year according to the following schedules (plus authorized student fees). These fees are due regardless of course registrations for the term. Continuing students who apply for and are accepted for transfer into the Dual Degree program are required to pay the outstanding balance. The iSchool Student Fee also covers a one-time student society fee assessed by Library and Archival Studies Students Association (LASSA). In addition to the tuition and fees listed above, students should expect to pay approximately $1,000 a year for ancillary UBC student fees. These fees are outlined in the UBC Calendar Student Fees section. Students should also allocate funds for any books, software, field trips and other related expenses. All new international students are required to pay a $120 medical insurance premium to provide health coverage for the three-month waiting period before they become eligible for the BC Medical Services Plan. For more information on this insurance and how to apply for provincial health insurance, visit the Student Health Insurance website. Student fees include an annual premium for the AMS Extended Health & Dental Insurance, which covers prescriptions, dental care and vision care. Students who already have equivalent extended health and dental insurance may opt out of the AMS plan. Students registered in Winter Session must apply to opt out by the end of the third week of classes. The extended health and dental insurance plan is not available to students who are registered only in Summer Session. Students wishing to opt out should contact the Student Heath Insurance provider directly.